People don’t often take into account that Draupadi didn’t want five husbands; she was forced into this arrangement by Kunti’s declaration. Our Indian myths and epics stretch back for thousands of years. Their roots lie in pre-history. It is no wonder, then, that as they travel down the ages, they are reinterpreted according to the values of each age. Because, on the whole, Indian society has grown more patriarchal over the last centuries, women in our myths and epics (and by extension, women in real life) are largely interpreted/judged according to the values of that society. But because we have now entered an era of female consciousness, these traditional judgements are now being questioned. Perhaps that is one reason why novels written about mythic characters are so popular in current times. And why many of them are focusing on female characters as narrators. Certainly that is the reason why I wrote The Palace of Illusions, a re-creation of the Mahabharat in Draupadi’s words, and why I have now written The Forest of Enchantments, a re-telling of the Ramayan in Sita’s voice. Because only when the woman tells her own story, in her own voice, with her own words and her own understanding of the world, will she cease to be misunderstood. Two characters who have experienced misjudgement over the ages in the Mahabharat are Gandhari and Draupadi. Gandhari is admired as a “pativrata,” a revered quality in a patriarchal society, because she blindfolded herself since her husband was blind and she did not wish to enjoy the sights he was incapable of enjoying. However, could we not evaluate her act differently, once we stop gazing through patriarchy-tinted glasses? Would it not have been better for everyone if she had, instead, functioned as Dhritarashtra’s eyes, pointing out problems in the kingdom and helping him deal with them? Perhaps, then, the battle of Kurukshetra wouldn’t have occurred. Draupadi, on the other hand, is traditionally frowned at for being the opposite of a “pativrata,” since she has five husbands. (Of course, it was common for most princely men at that time to have many wives-but let’s not go there.) However, people don’t often take into account that Draupadi didn’t want five husbands. She was forced into this arrangement by Kunti’s declaration that the brothers must share what they have brought to the house equally. And she actually followed very stringent rules, where she was wife to each brother for one year at a time. Perhaps most of all, Sita’s character has been hugely misunderstood down the ages for similar patriarchal reasons. 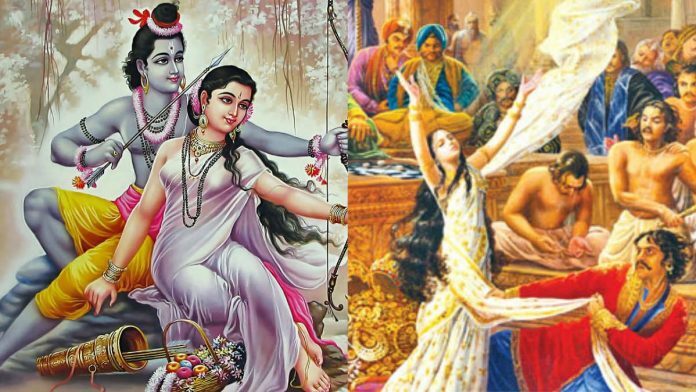 She is revered, it is true, and generations of girls are advised to “be like Sita,” but let us examine why. People constantly bring up Sita’s “pativrata” nature, her devotion to Ram, and her ability to endure hardships meekly. They don’t seem to notice her courage, willpower and spirit of adventure, which impel her to accompany Ram to the forest. Her willpower and her belief that she is in the right enable her to stand up against Ravan even though she is all alone in Lanka. As a result, in spite of all his strength and his magical abilities, Ravan does not-cannot-harm her. (I feel he is awed by her inner strength.) Her courage and willpower, once again, help her to bring up her two sons by herself after she is abandoned in the forest. And though Sita indeed loves him even after he sends her to the forest, when at the end of the Ramayan he asks her to undergo another agni-pareeksha to prove her innocence, she refuses and calls instead upon Mother Earth to take her away. She chooses to give up a happy life with Ram and her beloved children because she believes in doing what is right. She respects her husband, yes, but ultimately she respects herself more. I hope that today we-men and women both–will understand the power of Sita’s final action in the Ramayan for what it is. I hope that today we will admire her for the right reasons.